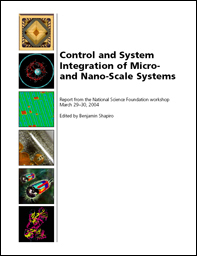 The 2004 NSF workshop on Control and System Integration of Micro- and Nano-Scale Systems brought together leaders in MEMS, nano-fabrication, modeling, bio/chemistry, and control to identify research and education issues that must be addressed to enable transition from micro- and nano-scale components to integrated systems. The workshop was funded by NSF support from Dr. Kishan Baheti, Dr. Maria Burka, Dr. Delcie Durham, and Dr. Masayoshi Tomizuka, and was organized by Assistant Professor Benjamin Shapiro (AE/ISR). The final report of the workshop is available online.